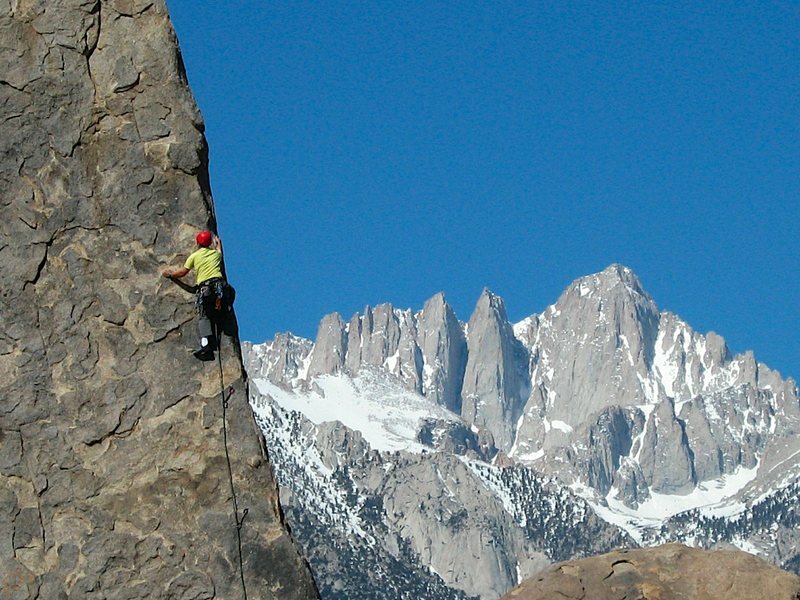 Lone Pine plays host to some fine micro routes, as well as some longer routes up in the Mt Whitney area of the Sierra Nevada mountains. In the cooler months the Alabama Hills area offers good sport and trad routes. While in the hotter months the Whitney Portal area provides a cooler alternative. Lone pine straddles the 395, 50 minutes south of Bishop, and about 3 hours north of Los Angeles. Mt Whitney from the Alabama Hills. Mt. Whitney from town. Photo by Blitzo. Mt. Whitney morning. Photo by Blitzo. Mt. Whitney. Photo by Blitzo. Lone Pine Peak. Photo by Blitzo. Whitney Portal Road. Photo by Blitzo. The Film Museum. Photo by Blitzo. The Shark's Fin. Photo by Blitzo.